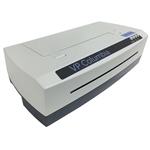 The VP Columbia is the perfect blend of tactile graphics and braille at 100 Character per second. 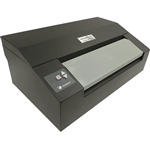 The Basic-D V4 is a classic double-sided embosser and is a cost effective braille production unit in the world. Basic-D V4 is controlled by an ink and braille labeled front panel. Combined with the speech feedback, it is easy to install and operate by blind and sighted users alike. Basic-D V4 is one of the most reliable traditional tractor fed braille embossers on the market. Index Basic-D V4 will easily cope with continuous braille production. Bring Basic-D V4 to the meetings in your organization. The high speed, low weight and the compact format makes it to the most portable braille embosser in the world. 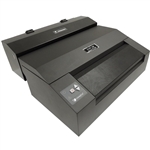 The Index Basic D-V5 is an improved embosser, which enables users to print from their cell phones and tablets! No computer required, just grab a USB. The Index Basic-D V5 offers fantastic voices and simple firmware upgrades. The Trident is a light-weight, double-sided embosser that produces our legendary quality of Braille and is compatible with all major Braille translation programs. Produces double-sided Braille up to 45 Braille characters per line. Embossing speed up to 100 characters per second. Embosses high-quality, Double-sided Braille on continuous form, tractor feed Braille paper up to 12 inches wide. Index Everest-D is the world’s most flexible embosser ever sold. You may use single sheet paper, plastic or even Zink plates to emboss magazines, labels and much more in double sided braille. The cutting edge Index Everest-D V4 is more stable then ever and now also supports the very popular 4X4 PRO newspaper format. It merges the successful models Index Everest-D and 4X4 PRO into one highly flexible embosser. Beside the flexible double/single sided embossing, Index Everest-D V4 has all the newspaper functionality of 4X4 PRO. The embosser is tuned up to a technological level that will be market leading for many years to come. The 100 characters per second VP Premier is truly a high volume production embosser. Built with rugged and durable components, this tractor fed embosser is built to outlast the competition. The VP Elite was built to with stand the toughest embossing requirements while embossing at 200 character per seconds. With the highest quality components available you can expect your braille requirements to get done reliably and quickly.